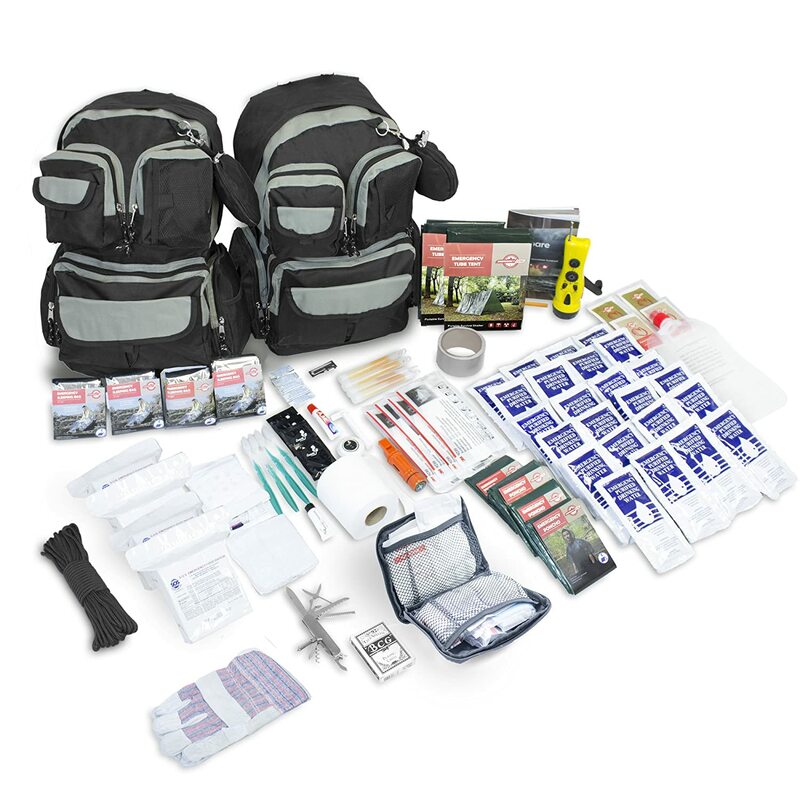 There is a lot of info out there about how to build a bug out bag. While there are some advantages to putting together your own, some people may just want an all in one solution to get them through a short term emergency or at least provide the foundation that they can add a few items to here and there. 1 What is a premade bug out bag? 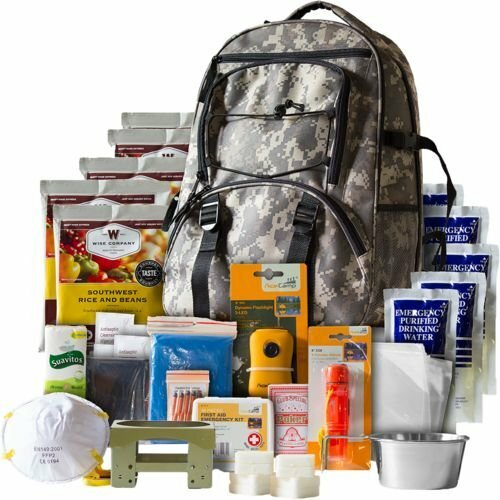 What is a premade bug out bag? A premade bug out bag usually is made to have food, water solutions, medical gear, etc. These bags can range from a kit that is made to get you through a 72 hour emergency to bags that are made for 2-4 people for 72 hours. More specialized bags are out there for longer term emergencies. If you are new to the world of prepping and survival then you may be looking for an easy way to get started by having the basics covered. These bags are designed to cover very basic survival needs but are not designed with supreme comfort or extras unless you are paying for a premium bag. Consider Pre made bug out bags do not always have the best quality of supplies and you have to be careful and read to make sure you know what you are getting. Making your own bug out bag has some major advantages but it definitely takes some time just to get the core supplies planned and procured. It is easier for a lot of people to budget a few dollars here and there on getting a bug out bag together rather than investing a large sum all at once. In the long run you migth get a better bag since you were able to think about it more and add as you learned what your real needs would be. We all come in different shapes and sizes which means that we need to consider this when deciding what bag we are going to be comfortable carrying for possibly many miles at a time. A pack made for a shorter or taller person than you may not be comfortable to use in a long emergency. Making your own allows you to customize your bag for special needs. For example my father is disabled and would need some specific items. You may have younger kids that need different stuff. Pre made bags do not consider special diet needs. Diabetes and high blood pressure are some of the most common concerns. Dietary concerns are a major deal when it comes to the included rations in a premade bug out bag. If you are on a low sodium or sugar diet then those survival rations may not do it for you. You can put together a better medical kit yourself. Medical supplies in some bags are fairly basic whereas when you aer building your own you can include things like battle dressings and blood stop powder. It really drives me crazy that most medical kits contain nothing to stop one of the most common problems, bleeding. Stitches are an extreme thing that take skill and time. Blood stop takes care of a situation immediately. Each pack weighs less than 15 lbs Packed! This option offers enough supplies to get a family started or ensure that 2 people are more equipped. There is an option that costs less designed for 2 people but you only get one pack and it is not enough of a cost difference between the 2 and 4 person version to justify the 2 person option. At the time of writing the difference is a mere $40. 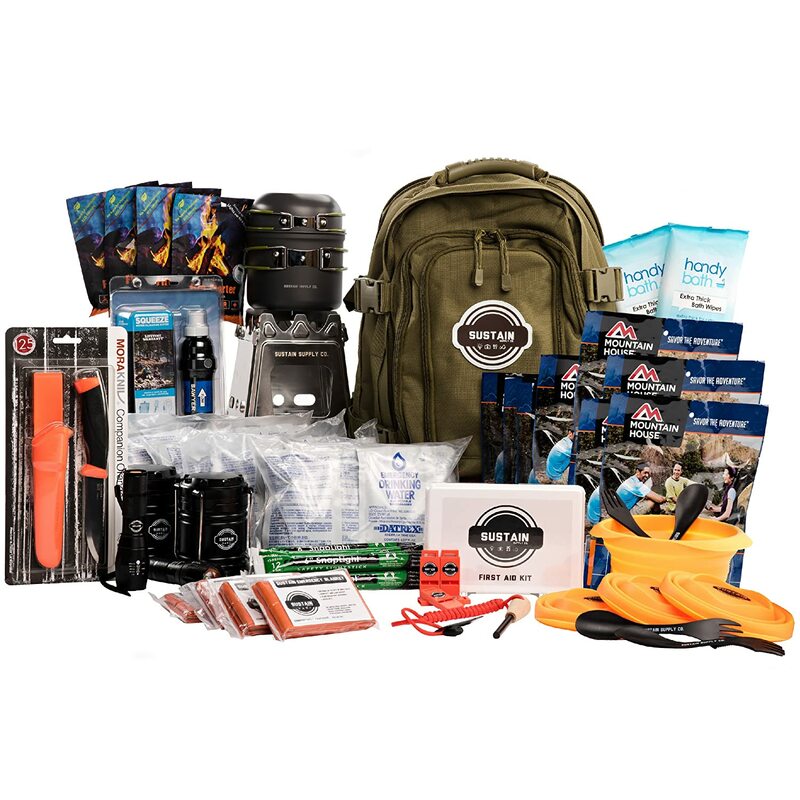 This kit gets excellent reviews from preppers. Considering how critical people can be of shoddy bags and supplies, it is always a good sign to me when a lot of other people have written detailed reviews. Benydryl Liqu-Gels – These work fast and can save someones life in an allergic reaction situation. 20 minutes faster when it comes to reactions can be the difference between life and death. I have a lot of great things to say about this kit because it is made to not just offer bare bones style supplies to get through 72 hours. While the food supply included only lasts that long, many of the other items would be great for a long term emergency. Instead of just offering prepackaged water and purification tablets you get a name brand Sawyer Mini and a hydration pack! Here is a list of all the items you get in this very high quality kit that is idea for a couple or even a single person that just wants to be prepared. 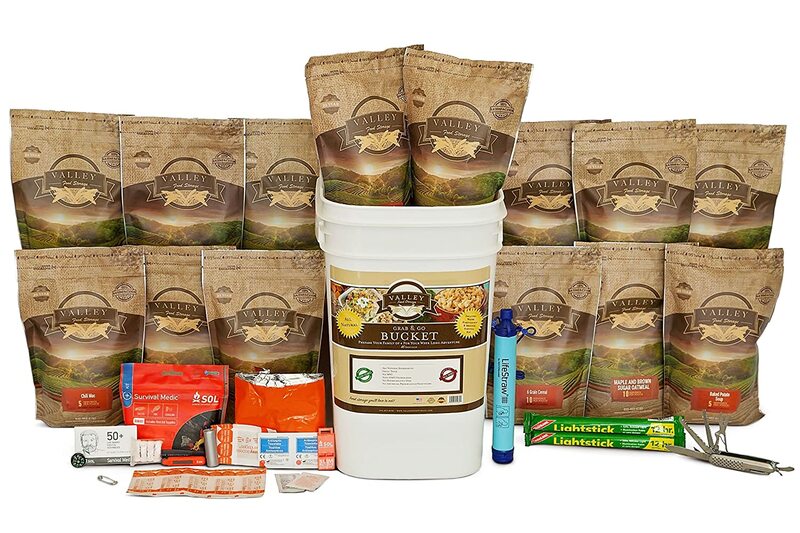 If going it alone this kit has enough food to last 6 days instead of 3. 3 days of quality Mountains House Food for 2 people. This food has a shelf life of 30 years so as long as you keep pests out of your bug out bag, you don’t have to worry about rotating your food out as often. The water included has a 5 year shelf life. A quality backpack: this pack offers a lot of compartments so items are easy to keep organized so you can get to them when you need them the most. Three different zippered compartments offer meet your primary organization needs. Lighting Needs: 4 Cyalume Snap Lights, Flashlight, and LED lantern are all included so you are covered pretty well for lighting. Some people do not realize that lights are not just about comfort but about safety as well. Falling, cutting yourself, or other injuries during a survival situation when medical help is not available is a more dire situation then it might normally be. Portable Stove: this stove is ideal for using with small twigs or canned fuel if you have the luxury of that. This is one of those items that could be used for a long term emergency with ease and there is something to be said for a stove that does not rely on fossil fuels for heat. Add two emergency bivys rather than just two emergency blankets. There is no shelter included in this bag at all. So sure this is find if you have a place to stay dry at least but if you are really bugging out and need to sleep outside you are going to want some type of shelter. I know this is not technically a bag but I think it is a good value and that buying a back pack to put it in and taking it out of the bucket is not a big deal, especially considering the quality. I will make a suggestion about what bag to use below. Valley Food Storage is known for making some of the highest quality foods for long term storage. I think quality food is important for morale and while cost can be a concern, consider that this bucket adds up to $50 per person for a week and you get survival supplies. That seems like a pretty good deal to me and far less money than I spend on food and beverage per person during good times at my house. When you consider that emergency supplies come with this, you are paying about $6 per day per person to eat high quality foods. I imagine if two of the people in your 4 person household are children, this bucket might get you through an extra day or two depending on your level of exertion. Special Pricing Note: You can use code “BDS” at checkout to save 10% off of your entire order. You might want several of these so you can break up the weight. During a bug out situation everyone needs a pack regardless. For kids go for something from a good outfitter that is made for their frame. Consider that this 4 person kit with a few bags to carry it all in and the extras I suggested would add up to well under 20 lbs per person and allow you to survive in style for 2 weeks without adding any additional food rations. The kit is 17 lbs before you add in any of the extras I mentioned so I am allowing 23 lbs for extras in my calculations. I am putting this bag on the list because it offers a lot for those that are on tight budgets or just want a very basic bag to stash back for a short term emergency. At the moment it is hard to find a pack that offers what this one does at this price point. At the time of writing, this pack was $50 shipped! While I would not want to try to survive long term with the supplies given after the food ran out, this would be an excellent choice for throwing in each vehicle you have. Some buyers note that the bag that comes with it is water resistant but not waterproof. One water resistant backpack in a plain color for blending in with others. 32 servings of Wise Foods. You get a good variety here and this pack is designed to offer you 3 full meals per day. The entrees you get are Southwest Beans and Rice (4 Serve), Creamy Pasta and Veggie Rotini (4 Serve), Brown Sugar Multi Grain (4 Serve), Apple Cinnamon Cereal (4 Serve), Hearty Tortilla (4 Serve), and Whey Milk (12 Serve) – This food has a 25 year shelf life! Tent shelter, even if it is just a cheap tube tent. This is a good idea just in case even if most of your bug out scenarios involve getting to solid shelter! So now let’s put together a bag ourselves and add up the cost and compare that to the pre mades! This is a bag for a single person. Keep in mind that some supplies could be shared among two or more people if needed so one person may want to carry extra food rather than their own camp stove for example. If you live in a harsher climate you may want to invest in a better tent. Note that these costs are at time of writing. By clicking on the links, you can get the most current price. Emergency Bivy Sack $8 If you want a bivy made for long term emergencies I recommend the SOL Longer Escape Bivy which comes in at $42. In total, my bag comes in at $350-$450 but that is allowing for some extra items that you may not care about like the tactical pen or radio. There are other areas where you could cut back as well like not having a radio or spending less on your medical kit. My kit was put together with the idea that a lot of items may need to last for a very long time in an extended emergency and deal with more major medical concerns if needed and for someone starting out with absolutely no supplies on hand already. Personally, I think everyone should have a firearm if they plan on bugging out. If you do have a gun then take the time to learn how to use it decently during good times. There are plenty of people that can show you how and if you really don’t know anyone there are classes you can sign up for. I carry a Bersa Thunder .380 usually. I prefer revolvers but it is hard to beat the capacity and the cost of the Bersa. I would love to carry my.32 Ruger H & R but it is heavier and only has a lot less rounds. The Ruger LCP is about $200 and very compact. A lot of people have bought these as a lightweight personal protection gun. I can carry the Bersa and an extra clip on my side and barely notice the weight. I also like that I can have one in the chamber and the safety on so it is ready to rock in a situation. Yet another great gun given to me by my husband. The first one he got me was one appropriate for Grizzlies when we headed to Alaska in our 20s. I knew I had a keeper when he bought me something useful and not something frilly! Things you already have and would want to throw in may include prescription medication and extra glasses. If you wear contacts then maybe throw those in but you should have actual glasses as back up. Cleaning and keeping up with a contact lens routine may not be possible during a SHTF scenario. Daily disposables may not be available and they take up a lot of space. Something for entertainment like a notebook and a few pens is a good idea and can be handy for communications. One of these could be your tactical pen! As you can see, none of the items on my list are expensive except the firearm so you can buy a few at a time and build a higher quality bag that is more suitable for your unique needs. While I know that plenty of preppers don’t like to expose their set up to others, if you do want to share what is in your bag or send a pic of the contents then feel free to either comment or you can send photos to [email protected]. If we get enough of a response I would be glad to do a post with your photos so others can learn from your bags. If you do not want your name mentioned then just let me know and I will leave it out. Excellent time to review the importance of a good bag to grab, the recent ballistic missile false alarm might make more people aware to have items ready to grab and run to the nearest shelter in only 15 minutes. Thanks for the links to get things we might still need to grab and a nice reminder to get out the bags we have and take stock. Always glad to do what I can researching and writing these posts. There is so much to think about when it comes to a bug out bag. With people living in a lot of different climates and dealing with a variety of personal and family circumstances on all levels (health, age, other special needs, etc.) planning a bag that is best for you takes some inner reflection and awareness of surroundings.At the same time there are some basics that everyone needs like food and the capability to make water clean to drink. Thanks for reading! great email! finally the event in the islands got my wife’s attention and she now sees the importance of preparing. tried for years to convince her but my clamoring went on deaf ears. nothing like a real event, even though a mistake, to get ones attention. today she is driving me crazy, wanting to know what we should do to prepare. once again, great article, keep up the good work! Any of these pre-ready kits are a good start . Just a start ! You must look at your environment, I live in the desert Southwest. Water is my main concern to start , even in winter. Compare that with someone buried in 6 feet of snow. Heat and staying dry will be there main concern . Very much appreciate your site. I always will learn from others. I have found one thing that may be of use is to install a battery disconnect on your vehicles. This can eliminate many problems of having to leave after an EMP or such other circumstance. Also today’s autos drain power all the time with theft deterrent systems and such. Excellent article, and also very timely because I am at this very moment assembling an emergency backpack for my car. Since I am old and small and live in MN, I will have to make several adjustments, including smaller size and weight of backpack, and having only non-freezable items. Two is availability- we have choices but never new where to get it from, we make do with many CCC – cheap China clones. Three, cost,these item proved expensive,up to now my soda can stoves are my secondary cooking option, open fire being number one. I am still hoping to get a trangia or one of its copy. Overall this article is good. Folks if you live in or near a big city, a nuclear power plant, you better either move or forget about it…cause nothing will save you…Sorry! But this is truth, I have searched out this over and over again and no amount of medications or back up will help…you will be contaminated and if help comes, they will put you in special holding area to let you die or be killed. FACT!